Many of the golf newbies who are playing golf in Branson aren’t aware much how proper golf posture can help improve their game. 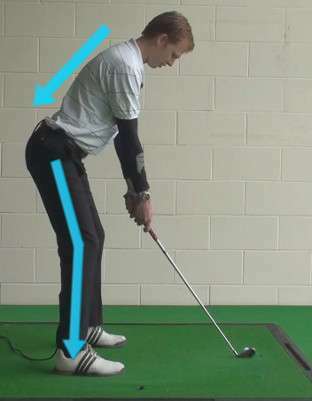 Proper golf posture is crucial for consistency, accuracy and proper ball striking. You don’t have to be an expert golf player to achieve great posture over the ball. Your golf swing is essentially a turning motion around a central column which is your spine. The better the position and the angle of your spine at address, the better is your swing, especially at impact. There are two main components to the golf stroke, they are the swing and the posture. Both of these elements have to work harmoniously, no matter how you keep your head and spine, you’ll not be able to hit your best shot unless you put a good swing on the ball. Vice versa, it’s impossible to make a good swing on it if your posture is not right. This is the reason why golf instructors everywhere always stress the importance of good posture. Proper posture can really help improve your game. Maintaining proper golf swing posture throughout your entire swing ensures that if you do your best swing on the ball, you should hit your target. Golf posture has a positive influence on power production. If you look balanced and solid, with great spine angles, you will be able to put your body into that address position. It’s impossible to get a good shot without proper posture. Similarly, swinging a golf club without appropriate postural stability is less productive. Functional posture makes a world of difference in your swinging action and lets you impart more force in striking your ball. Body structure and posture are characteristics of a golfer, with improper golf swing, it can cause muscle imbalances just as muscle imbalances can cause an improper golf swing. These imbalances can’t be felt quickly not until they cause a disruptive physical problem via an escape route. Every postural imbalances can cause some sort of adaptation in movement; some are innocuous, but some lead to diminished power as well as potential injury. Below are some common physical limitations that can greatly affect your game. Reduced neck rotation can make it difficult to keep your eye on the ball during the swing. Insufficient trunk strength interferes with your ability to transfer forces from the lower body to the upper body. Tight hamstrings do not allow an effective address position to be achieved. Reduced range of hip motion leads to compromised swing patterns and lower-back pain. Decreased trunk rotation limits shoulder turn, which can cause poor sequencing between the hips and trunk, it can alter the swing place, and potentially causes back pain. Insufficient shoulder strength, especially in the rotator cuff, leads to decreased club-head speed, as well as poor deceleration and poor club control. Whether you are a pro golfer or a newbie, you should know that your posture plays an important role on your golf swing.